Clicking a number in the image below will take you directly to that feature. Clicking the number next to the feature description will bring you back to the top of the page. 2. Keypad Allows you to dial phone numbers, enter letters, and choose menu items. 3. 4-way navigation pad and Select Button Allows you to scroll through menus and highlight items. Use the Select button to select an item that is highlighted on the screen. Scroll up and down to see menus and highlight items. Scroll right and left to scroll horizontally in multi-column displays. Press to open a menu. Press to play a ringer item. Press to access other features as described on the screen. The Select button does not take action. 4. Messages Button Auto-dials voicemail. 5. Services Button Opens/closes the Services menu. 6. Headset Button Toggles the headset on or off. When the headset is on, the button is lit. 7. Mute Button Toggles the microphone on or off. When the microphone is muted, the button is lit. 9. Speaker Button Toggles the speakerphone on or off. When the speakerphone is on, the button is lit. 10. Settings Button Opens/closes the Settings menu. Use it to change phone screen and ring settings. 11. Help Button Activates the Help menu. 12. Directories Button Opens/closes the Directories menu. Use it to access call logs and directories. 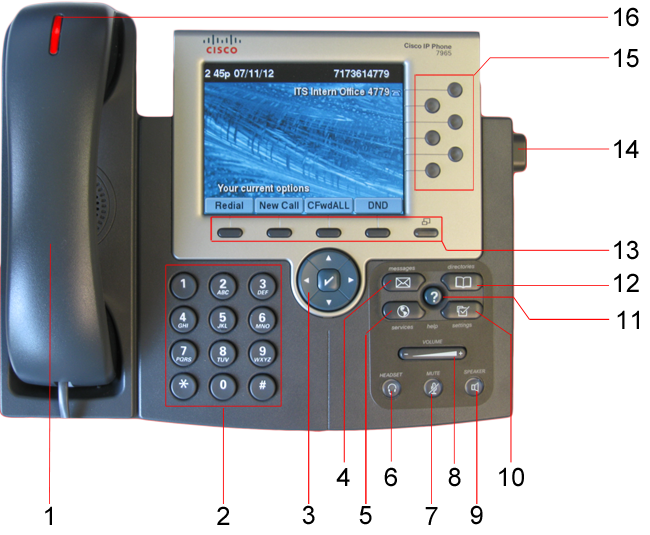 See Phone Functions - Directories for more information. 13. Softkeys Each activates a softkey option (displayed on your phone screen). 14. Footstand Button Allows you to adjust the angle of the phone base. 16. Handset Light Strip Indicates an incoming call or new voice message.